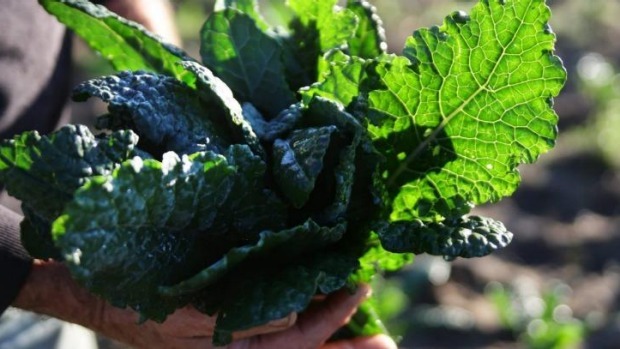 Where did the superfood kale come from? Only three words should come after super. Man. Phosphate. Annuation. Kale is a northern British word for Brassica oleracea var acephala, which basically means cabbage without a head. During the Middle Ages kale was the go-to green leafy vegetable. It was easy to grow, fairly frost resistant and a healthy addition to any mealy gruel. At the end of the Middle Ages kale mutated to develop a "head" and so cabbages were born. Stone-walled kailyards can still be found in the Scottish highlands. In southern England kale was known as "cole" or "colewort". Colewort was transformed in the southern states of the US to "collard", as in "black-eyed peas and collard greens". Although I loathe elevating any ostensibly peasant food into the Superfood Halls of Justice I will say that I lived on kale and lentil soup when I was living in Scotland for two years. I washed it down with Scottish ale and single malt whisky and have never been healthier. You have what is called freezer burn, in which water escapes from the food to the air surrounding it in the form of ice crystals, effectively freeze drying the food. Follow the lead of frozen dinner manufacturers, who carefully cover any meat in a layer of thick sauce or gravy. Don't spread your food out, instead arrange it in compact piles to reduce surface area and therefore air contact. Cover tightly with plastic film and aluminium foil, and label with date and contents. You could take a container of brown rice and fork it into your mouth defiantly in the corner but I assume you want to get on with your colleagues. Allium is the botanical genus that contains garlic, leeks, onions and shallots. So going to an Italian restaurant could possibly drive fear into your heart with no way of avoiding cramps and pain after eating – right? Give the restaurant a ring. Although Italians are genetically programmed to put garlic in everything they are also one of the most hospitable races on earth, plus they are exceptionally creative cooks who will be able to navigate a course for you around their dishes. My partner has this problem. We always call ahead and it's rarely a hassle. Some cheeses are made in an acid environment either by adding acid to make the milk curdle or by using lactic cultures. This acid stops the calcium from helping the protein to form long, ropy strands and instead come together to form clumps. When you heat these types of cheeses, such as Indian paneer or Italian ricotta, they lose moisture but the proteins hold tight. Other cheeses, such as mature cheddar or parmesan, don't become stringy when you heat them because the enzymes have broken down those long, ropy protein chains as the cheese matures.